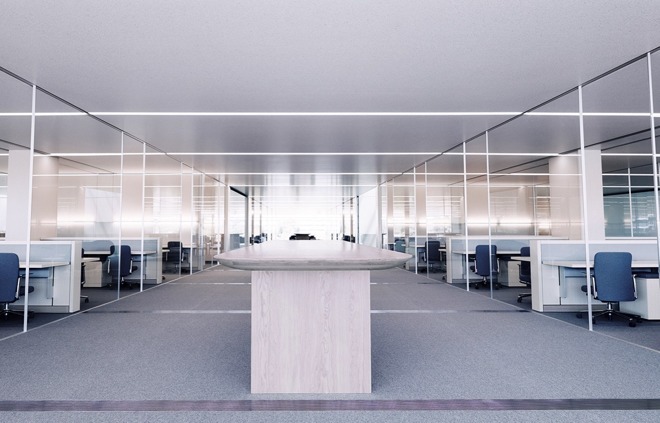 The Apple Park's open, collaborative design is broken up into pods, separated by glass panes from floor to ceiling —and distracted employees are walking straight into them. An account by Bloomberg published on Friday discusses the issue. Employees have come up with a solution for it, by putting sticky notes on the doors, but they keep getting removed because they detract from the design of the facility, said sources familiar with the matter. Bloomberg reports that "there are other markings" to identify the glass, but didn't make clear if they were improvisational by the employees, or permanent by the developers. If the latter, they don't appear to be working. So far, official Apple channels have not responded to requests for comment. AppleInsider wasn't able to verify the claims of injuries with OSHA, nor its own sources. However, one of AppleInsider's sources within the company not authorized to speak for Apple was amused by the reports, and said that she "saw [the impacts] coming, a mile away." On Feb. 22, 2017, Apple officially named the "spaceship" campus. The entire facility is now called "Apple Park," with the 20-foot tall and 165 foot in diameter glass auditorium honoring one of the founders of the company and named the "Steve Jobs Theater." Apple held its first official event in Steve Jobs Theater on Sept. 12 with the unveiling of the iPhone 8, iPhone 8 Plus, and iPhone X.